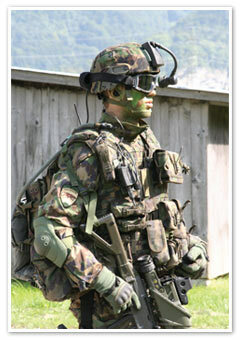 In April 2010, Germany’s Federal Office of Defence Technology and Procurement (BWB) signed a contract with EADS Defence & Security for a further 220 units of the Future Soldier System (Infanterist der Zukunft) in its basic version (IdZ BS). This is part of an immediate procurement measure to meet the needs of the Bundeswehr forces deployed in Afghanistan in the context of the International Security Assistance Force (ISAF) mission. It means that another 220 Bundeswehr soldiers will be supported by the tried and tested soldier system for mission preparation and execution. The roll-out of the IdZ BS for the troops back in 2004 was a rapid response to the increased needs of the infantry in the Bundeswehr’s missions. It made the Bundeswehr the first army in the world to have so rapidly and comprehensively increased and deployed the capabilities of its infantrymen. This would not have been possible without the close cooperation that took place between the users, procurers and the ‘Soldat’ (soldier) systems house under the leadership of EADS Defence & Security. Since entering service with the Army, Navy and Air Force, the IdZ BS system has proved its worth in the Bundeswehr’s foreign missions, offering soldiers not only day-to-day protection – especially against the current threats in Afghanistan – but also highly increased capabilities in terms of command and control, navigation and weaponry. 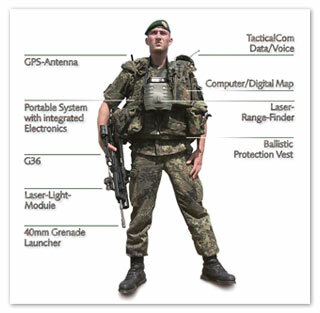 An IdZ BS system for equipping an infantry squad of ten soldiers, consists of an identical basic configuration for all soldiers which includes a modular bullet-proof vest in protection class I to IV, C4I equipment including NaviPad for situational awareness and transmitting messages, target data and images, night vision device, tactical radio and various special items such as laser range finder, camera and thermal image sighting device. On the basis of the experience gained with IdZ in ongoing missions, the continuing expansion of requirements and threat situations and the newly available technologies, EADS Defence & Security developed the Warrior 21® concept. The main principle and feature of Warrior 21® is its open architecture. Based on a data and energy bus system, and standardised interfaces, Warrior 21® can be rapidly configured to meet customer requirements and made into a suitable end product. Individual components can be quickly exchanged and integrated in the product. This facilitates the involvement of local industries and suppliers, which is so often a condition of procurement projects, and additionally ensures the growth capability of the Warrior 21® product. Warrior 21® is a modular, scalable system that is capable of growing with the increasing demands on soldiers and with future technologies through changes at the component or subsystem level. In view of the increasingly asymmetric threat situations arising and the challenges presented by missions within the context of network-enhanced operations, enhancing effectiveness, assertiveness, protection and rapid and secure information exchange via more powerful information and communication systems for the deployed infantry forces is of ever greater importance. State-of-the-art infantry systems like Warrior 21®, which is based on the IdZ BS, offer deployed forces maximum effectiveness, protection, means of communication and situational awareness information, ensuring that they are well-equipped and protected when performing their demanding tactical operational tasks.